A saddle’s not even required, yet there’ll be plenty of Western action for all. It’s the annual Rodeo Days at Burlingame, “where the rail crosses the trail,” right on Highway 56, Saturday, May 20, announced Mark Hecht, local Chamber of Commerce official-businessman-enthusiast. “We have a packed line-up of activities set this year for our community celebration planned to draw attention to the 47th annual Santa Fe Trail Rodeo sponsored by the Burlingame Saddle Club, with performances both Friday and Saturday evenings,” Hecht said. About everything imaginable will be available and most uniquely envisionable when over 70 vendors and craftsmen from throughout the Midwest open their displays at 9 o’clock, filling the entire wide brick street of the west end of Santa Fe. All are welcome to enter the pie baking contest, with an auction of the winners and all competitors to be at 9. Always key to Burlingame Rodeo Days are the younger generation, and that includes the really little ones. The cutest baby contest is at 9:30 a.m., with selection to be followed by the Farm Bureau Pedal Pull at 10 a.m., for those ages four to just shy teenagers. Registration for both begins at 9. Also on tap for the kids will be pony rides, a petting zoo, mini train rides, Prairie City Miniature Horses, inflatables, rock wall climb, bungee trampoline and “much more for the kids of all ages,” Hecht promised. Braken on the Bricks Car Show will draw classics, customized and more vehicles of most every color and condition, with entries welcome up to show time at 10 a.m. The tractor show moves downtown this year and will share the east end of the Trail with the car show. What would a rural community celebration be without music? And, Rodeo Days will have some of the best, Hecht promised, in announcing that The Jersey Creek Jam Band and others are set to entertain 11 a.m.-2 p.m. on “Stage 56” and in front of the Schuyler Museum. Now, those are the scheduled features, but whenever one gets to Burlingame, there’ll be features ongoing. Detailed map and schedules will be available at the Chamber booth. Included are a quilt show along with ice cream at the library, Dave Prescott operating his sawmill, and samples of authentic chuck wagon cooking. The Schulyer Museum is to be open all day, followed by a taco and baked potato feed at 4 p.m. Anticipated highlight always is the Salute to the American Cowboy Parade with entries expected and welcomed from wherever one wants to come with a horse, carriage, car, float, anything special for all to enjoy. Lineup is in the high school parking lot and parade starts out at 3 p.m. The 47th Santa Fe Rodeo kicks off Friday night, May 19, with the grand entry cowboys and cowgirls on parade at 7 p.m. Saturday night, May 20, rodeo continues at 7 with another night of Western flare. A youth king and queen, boys and girls seven and under, will be crowned from a nightly rodeo drawing. Additional rodeo highlights for the kids each performance include Mutton Busting, with signup at 6:30 p.m., and a calf scramble. Attraction specifically for local rodeo contestants is the steer mugging, with entries taken each evening until the rodeo begins. There’ll be a MoKan Junior Rodeo beginning at noon on Sunday, May 21. 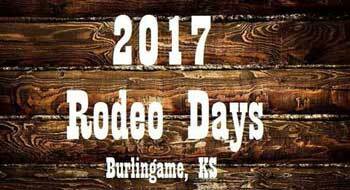 “Ya’ll come to the greatest fun in the Midwest, it’s Rodeo Days right on the original Santa Fe Trail, Saturday, May 20, in Burlingame, Kansas, America,” Hecht welcomed. 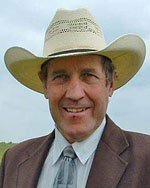 Frank J. Buchman is a lifelong rancher from Alta Vista, Kan., lifetime newspaper writer, syndicated national ag writer and radio marketing consultant.